Henry SHEA was born about 1715 in Dublin, Dullin, Ireland. Henry married Margaret HOLLINGSWORTH on 10 Jun 1739 in St. Catherine's, Dublin, Ireland. Margaret HOLLINGSWORTH [Parents] was born in 1719. Margaret married Henry SHEA on 10 Jun 1739 in St. Catherine's, Dublin, Ireland. Jason Todd LOGAN [Parents]. Jason married Tara Leigh DAVIS. Tara Leigh DAVIS. Tara married Jason Todd LOGAN. Reilly Elizabeth LOGAN was born on 7 Oct 2005. Jerry Wayne BLOODWORTH was born on 21 Aug 1945. He died on 4 Mar 1977. He was buried in Mount Olive Cemetery, Pauls Valley, Garvin, Oklahoma. Jerry married Connie Aulena MAPLES. Connie Aulena MAPLES. 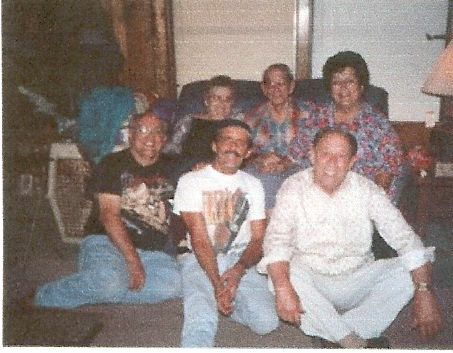 Connie married Jerry Wayne BLOODWORTH. SANDERS. SANDERS married Connie Aulena MAPLES. Connie Aulena MAPLES. Connie married SANDERS. Anthony VON PONGRACZ. Anthony married Erin Raschelle "Shelly" BLOODWORTH. Erin Raschelle "Shelly" BLOODWORTH [Parents] was born about 1970. Erin married Anthony VON PONGRACZ. Victoria "Tori" VONPONGRACZ was born about 2008. Orville Deville HOLLINGSWORTH [Parents] was born in 1869 in , Howard, Indiana. Orville married Nellie Mae RAMSEYER on 4 Oct 1893 in , Howard, Indiana. Nellie Mae RAMSEYER was born in May 1876 in , , Indiana. She died about 1951 in , Howard, Indiana. Nellie married Orville Deville HOLLINGSWORTH on 4 Oct 1893 in , Howard, Indiana. Kenneth E. HOLLINGSWORTH was born in May 1895 in , , Indiana. Daisy F. HOLLINGSWORTH was born in Mar 1900 in , , Indiana. Orville Mark HOLLINGSWORTH was born on 27 Sep 1911 in , , Indiana. He died on 6 Sep 1989 in San Diego, San Diego, California. M iv Billy J. HOLLINGSWORTH was born on 18 Jun 1919. He died on 13 Dec 2000. Billy J. HOLLINGSWORTH [Parents] was born on 18 Jun 1919 in West Middleton, Howard, Indiana. He died on 13 Dec 2000 in Sapulpa, Creek, Oklahoma. Billy married Mary Eva SMITH on 2 Aug 1938 in , Colfx, Indiana. Mary Eva SMITH. 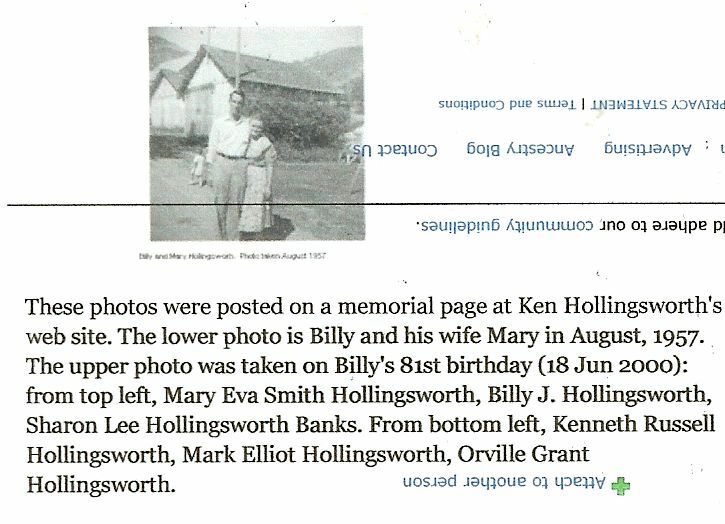 Mary married Billy J. HOLLINGSWORTH on 2 Aug 1938 in , Colfx, Indiana. F iv Sharon Lee HOLLINGSWORTH. Larry Martin JONES [Parents] was born about 1849. Larry married Donna LEDDY. Donna LEDDY. Donna married Larry Martin JONES. Hiram Whitmore BONNER [Parents] was born on 2 Mar 1855 in , Choctaw, Alabama. He died on 22 Feb 1929 in Andrews Chapel, Clarke, Mississippi. He was buried in Andrews Chapel, Clarke, Mississippi. Hiram married Fannie Vexie BONNER. Fannie Vexie BONNER was born in 1866. She died in 1939. Fannie married Hiram Whitmore BONNER. Angus BONNER was born in 1890. He died on 20 Oct 1958. Frank Elmer WHITE [Parents] was born on 6 Feb 1873 in Bedford, Taylor Parish, Louisiana. He died on 19 Sep 1948 in Rest, Woodson, Kansas. He was buried in Elmwood Cemetery, Chanute, Neosho, Kansas. Frank married Cora Alice STRINGER. Cora Alice STRINGER was born on 22 Aug 1877 in Springfield, Sangamon, Illinois. She died on 22 Apr 1927 in Chanute, Neosho, Kansas. She was buried in Elmwood Cemetery, Chanute, Neosho, Kansas. Cora married Frank Elmer WHITE. James Richard WHITE was born on 1 Nov 1902 in Marshall, Logan, Oklahoma. He died in 1983 in , Los Angeles, California. Mary Esther WHITE was born in Wichita, Sedgwick, Kansas. She died in Bellflower, Los Angeles, California. Elmer Frank WHITE was born on 5 Feb 1905 in Wichita, Sedgwick, Kansas. He died on 30 Nov 1974 in Fullerton, Orange, California. He was buried in Loma Vista Memorial Gardens, Fullerton, California. M iv Earl Lee Roy WHITE was born on 17 Aug 1907. He died on 25 Oct 1989.